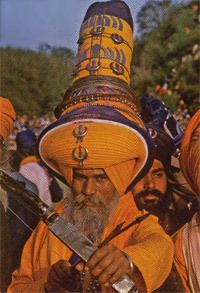 Hola Mohalla, the Sikh festival, is celebrated on the first day of the lunar month of Chet in the Nanakshahi calendar. The foremost and ostentatious festival attracts huge followers for its lively and fun filled celebrations on the land of imposing Punjab. The occasion generally is celebrated in March every year. Mock fights, Kirtan, music and poetry competitions are the integral parts of the colorful festival. On the auspicious occasion innumerable weapons are exhibited. Even though the festival is celebrated throughout Punjab and Haryana but the origin of the festival is Anandpur. This is mainly a community festival where people belonging to Sikh community congregate together to uphold the traditional cultures and harmony. It is definitely as occasion when whole Sikh community commemorates the brave soldiers who had fought for them against Mogul king and Rajputs. An early morning prayer marks the beginning of the impressive and captivating festival. Irrespective of their social position, everyone involves themselves in manual labor such as cleaning Gurudwaras, washing dishes, cooking and serving langars (local food).